86% of new players recommend this casino 40 new players chose this casino today! Are you looking for Las Vegas slot machines and casino games? Then you’re in the right place! Win Fun Casino is a new free slots casino that you can download to your smartphone. And you can play the games completely for free. Plus, U.S. players are accepted! Developed by Wizits, this casino app brings the best slot machines and classic casino games to your phone. Keep reading to find out more. Getting FREE coins has never been easier! Download the app – BOOM– you have 50,000 FREE coins. Connect the app to your Facebook account – you get more free coins. Open the app over the next four hours – again you get more coins. Play every day – each day you'll get more free coins bonuses! Level up – more coins are yours. Follow Win Fun on Facebook or Twitter and you’ll see even more chances to get free gifts, exclusive offers, and special prizes. There are many ways how to increase your bankroll. And it’s definitely worth to do so because you won’t run out of the games any time soon. You don’t need to go to Vegas to get the casino experience you deserve. Do you want bright lights, upbeat music, and only the best casino games? Wizits brings it to your phone! More than 80 of real Las Vegas slots are here for you to discover. 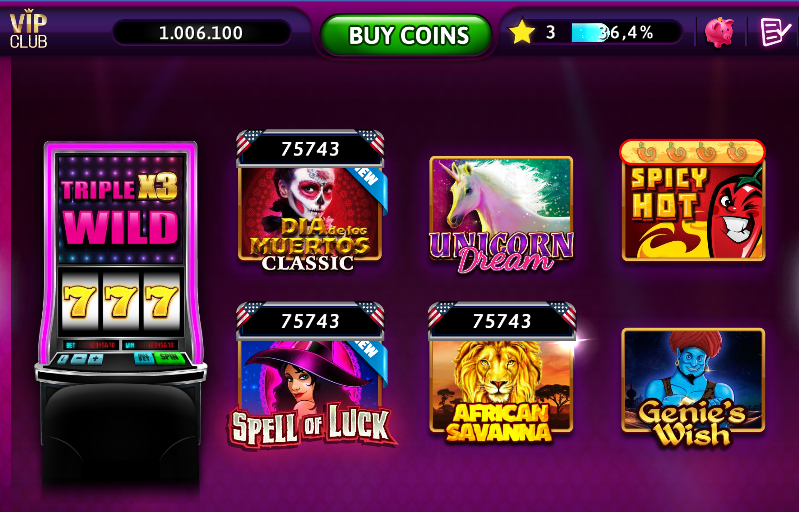 You can play one-line classic slots, such as Spicy Hot or Dia De Los Muertos. Or make your dreams come true with Genie’s Wish. The app also features more advanced slots like Crystal Quest where each spin advances you in a journey. Along the way to your destination, you can play many mini-games! Plus, the slot features a jackpot and free spins! And that’s not limited to this game. Each slot features crazy bonuses, such as free spins, re-spins, other slot-limited gifts, and jackpots! And more slots and jackpots are added weekly. You can unlock some new slots once you reach higher levels, thus, there’s always some new games to look forward to. Special occasions like holidays also open a window of opportunity to try some themed slots before you unlock them. Memorial Day gave us Wild Eagle, New York New York, Liberty Bell, Indian Totem, and more themed slots. And now I can’t wait to see what Christmas will bring! And there're always some tournaments going on in case you want to compete for more coins. Win one and you get up to 3,000,000 FREE coins! And since the app is new and not that well known yet, fewer players mean more chances to get to the top 3. Las Vegas slots are not all Win Fun got! You can play video poker – Jacks or Better, Jacks or Better 10 hands, and Deuces Wild. Blackjack’s fans will not be disappointed with Win Fun’s Blackjack game. If you prefer roulette – not a problem. The wheel is spinning big time at Roulette Multiplayer. And there is Baccarat game, too! Wizits knows what you want, and they deliver. You can contact Win Fun Casino on Wizits website, Facebook, Twitter, and on the app stores. Win Fun eagerly responds to the comments and reviews. And you can get the reply within few minutes. Win Fun Casino, previously known as Spintagram, brings the only Vegas experience you need on your phone. Many apps claim to do so. But give it a few minutes and a couple of spins. And you’ll see that this one is the real deal. 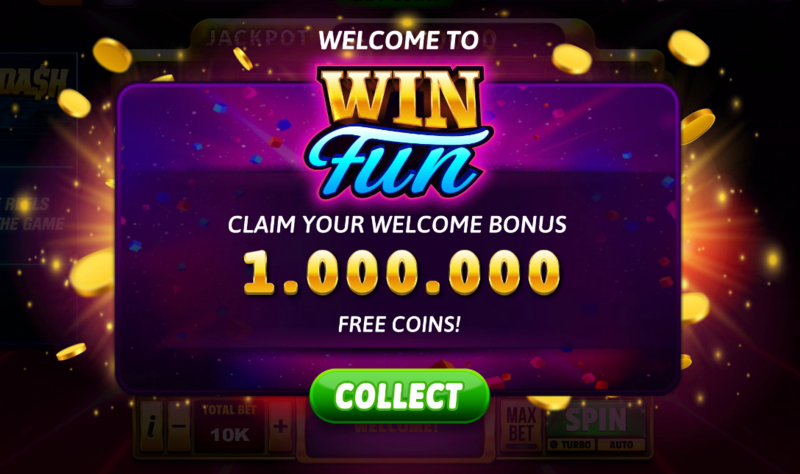 Win Fun Casino app is available on iOS and Android devices. You can also play it on the desktop as soon as you log in to your Facebook account.